I make audio stories, mostly non-fictional, and I am a sociologist; sometimes I combine the two. 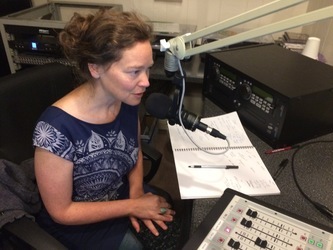 Transformation and the connections between political and intimate realms are key themes in my radio making. My audio pieces have been broadcast on community and public radio stations across Europe, North America, Australia and Israel. They have also been part of numerous live events and art exhibitions. Since 2017, I have created several public sound installations for Tonspur Kunstverein Wien at the MuseumsQuartier in Vienna, Austria. 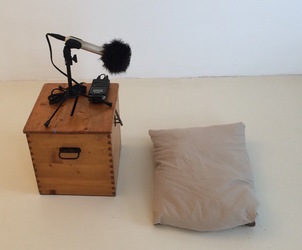 Two of these installations, Haus, parts 1 & 2, are sonic autoethnographies about Holocaust postmemory in Vienna. My very recent work is in live performance: sound installation meets experimental documentary with transmitters and radios. I also produce radio stories and documentaries, most recently You Will Not See Me Die (co-produced with Wendy Call) for Australian Broadcast Corporation/ Radio National. My radio documentary Laws of Lost and Found Objects won the 2016 Grand Prix Marulić. From 2014-16, I was a Tending Space Fellow with the Hemera Foundation, which supports people who have Buddhist and art practices. I am a faculty advisor at Goddard College in Plainfield, Vermont. I co-organize an audio listening circle called Audio Hearth in western Massachusetts where I live. And, I produce the creative radio sonic zine SkEtchPAd, broadcast and streamed biweekly on WMCB 107.9lpfm. I also lead listening sessions on the politics of storytelling, and I teach production workshops in radio storytelling and radio autoethnography. I write about radio, critical storytelling and autoethnography, performativity of language and story as methodology. Recent articles have been published in Qualitative Inquiry, International Review of Qualitative Research, and Rethinking Marxism. I am grateful to many people for the joys that come from audio-making! Thank you family and friends, teachers and mentors, students, collaborators, the Hemera Foundation, studio das weisse haus, Orange 94.0FM in Vienna, Tonspur and the MuseumsQuartier, Saari Residence + Kone Foundation, the HearSay International Audio Festival, and the Third Coast International Festival for fanning the flames of this form. Also grateful to the Buddhist Peace Fellowship, Buddhist sanghas I am part of and many contemporary indigenous scholars and others working on the politics and poetics of narrative. Thank you Laura Wulf for your photos throughout this website. Donald Saaf painted the image "Sound Collector" for this website.